The second unit of reinforcements for my 1,000 point list comes in the form of the new and very promising Demigryph Knights. I mentioned in the Wizard review that I needed to give my force some more teeth, well it turned out to be some beak instead. And claws, lots of claws. I don’t know about you but I really like the models for the Demigryph Knights. They have the right balance of fantasy and functionality that, for me, is required in an Empire army. The oversized heavy plate barding gives them a real sense of war worthiness: something to keep all but the pointiest of sticks at bay, all the while the Demigryphs get down to the business of ripping off faces. Their riders are regal and imposing with just a tinge of arrogance to them, which is exactly as they should be seeing as they’re knights. Riding on Demigryphs. With big sticks. Of the three poses for the Demigryphs themselves, one is awesome, one is good, and the last one is a bit meh – it’s cocking its head to the side which although accurate fluff wise, is a little too much like an oversized chocobo for me. Younger readers will have to Google what one of those is. You young whipper snappers. They really are another unit goes under the ‘reward’ title for painting as they look great and as there’s only three of them you’ll stay the course in terms of effort. 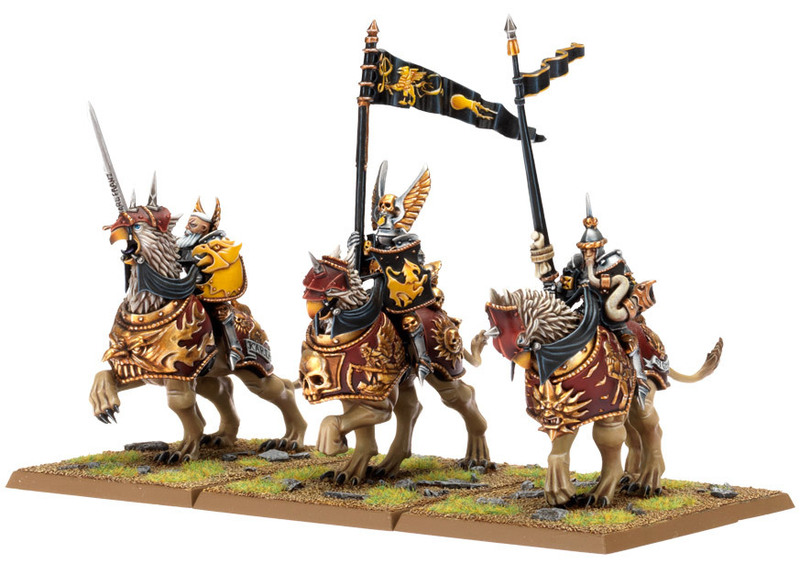 When Games Workshop started to release Monstrous Cavalry for the various armies I wasn’t sure if the Empire would even get any at all, or if they did, what would the mounts be as the Pegasus had sort of been bagsied by the Bretonnians – despite it still being a mount choice in the Empire book. The use of a ‘half’ griffon made me wonder why I hadn’t thought of it before, which is a good sign as the decision is a little obvious in hindsight and makes total sense. Rare praise for Games Workshop these days. And in doing so has given the Empire a unit capable of actually doing some real damage in combat (honestly). The Knights themselves are fantastic, and just make me weep over the missed opportunity that is the old Knightly Order kit even more. The heads are great, gifting you the pleasure of choosing which ones to leave out rather than which ones to include – likewise for the shields, plenty of good choice with a nice range. The stylization of certain armour elements into pointed beak shapes works very well and really tells the story that these guys are an elite unit rather than Knights given Demigryphs to ride for the day. All the weapons arms/options included look good enough to make you pause for a difficult aesthetic choice. If and when the old Knights do get a new kit, if they look anything like this there will be much rejoicing in the street, songs will be sung, mead will be drunk and babies will be named in honour of the sculptor. I’m predicting a significant rise in the number of Empire cavalry armies you’ll see galloping around what with them being a pretty good investment for the points. Rules wise, you couldn’t ask for much more as an Empire player: the Demigryph Knights are a unit to be feared by almost anything. [Except Skullcrushers! -Ed.] The Demigryph itself kicks out 3 Strength 5 attacks basic plus another for its Stomp for a total of 4 at Strength 5, and then the already Inner Circle Knight on its back adds another at either Strength 5 or 6 depending on how you arm them. But this is where one of the very few annoyances rears its head: if you choose to equip them with halberds instead of lances (which is a choice most people would usually go for) there’s no rules exception for using a halberd while mounted so you lose your shield. The 1+ armour save is a big deal for mounted units and sacrificing it for an extra point of Strength is not a decision to be taken lightly – and most seem to have stuck with the Lances as a result. I fail to see why the Halberd could not have been an upgrade rather than a free weapon swap and let you still use the shield – as represented on the models themselves. But still, with a box of three being able to chuck out up to 16 attacks at Strength 5 or 6, they can tear apart small to medium-sized units and elites really have a lot to fear as the Demigryphs have the armour-piercing rule to boot giving them -3 to armour saves. With the errata on Monstrous Cavalry stating you use the higher value for both Wounds and Toughness now, you’ve also got a unit that is now quite resilient too at Toughness 4, 1+ armour save and 3 wounds each. Deliver them into an enemy flank and they’ll eat anything. Someone even mathed out that they can beat Skull Crushers in straight up combat as the Initiative 4 on the Demigryph means it goes before the Juggernaut, and that’s at 12 points less per model too. [It’s worth noting though that the article go the Skullcrushers armour save wrong so it’s probably about even. -Ed.] It’s just a pity you can’t take them as character mounts so they can lead a unit, but maybe that is just taking the cracker. Demigryph Knights are available from Firestorm Games priced £30.15.